Have you ever faced a situation wherein your apps tend to get stuck in the download mode? This is a very troubling situation and you might be itching to know as to how you can fix it. Sometimes, the apps have almost downloaded but then you get an error in the end. This situation can be extremely irritating. In this article, we will be showing you the multiple steps which can be used which should help you in fixing this baffling issue. By the end of this article, your apps should resume downloading smoothly. So, let us see what they are? When you are downloading the apps, it is important to ensure that you have a working internet connection. So, you can load your web browser and see if the web page opens. This is a right test to see if the data is connected. If not, you need to turn the mobile data on. Try and resume the app download after that. 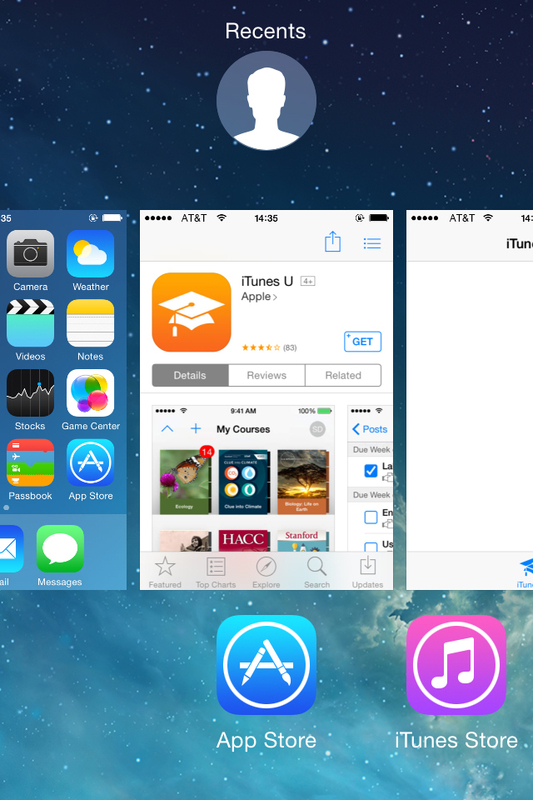 iOS allows you to delete apps even when it is being installed. You need to hold down the app icon and the apps will begin to wiggle. All you have to do is tap on the X icon which will be found on the upper left corner. Then, confirm that you will delete the app. Now, download it from the app store all over again. Apps may stop downloading owing to space constraints as well. So, you should keep an eye on the available space on your iPhone. You can head to ‘Settings’ and then ‘General’. Now, move to ‘About’ to check the detailed information. 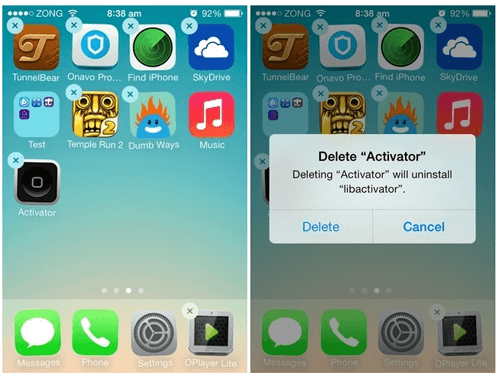 If you are looking to delete the unwanted apps as well, you need to follow these steps. 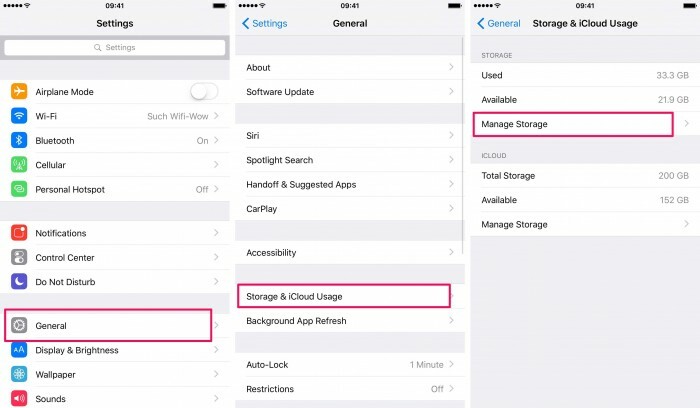 Settings -> General -> Usage -> Manage storage and then look for the app you want to delete and then hit ‘Delete app’. 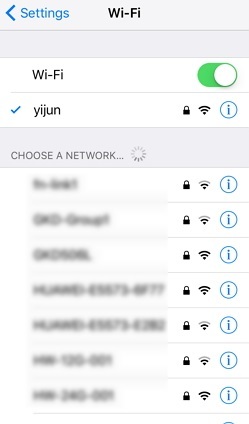 You also need to check the Wi-Fi connection as well, your data network is not stable, you have to download the apps over your Wi-Fi connection. So, you can either restart your network or even connect to another Wi-Fi network if available. See if this works out. Try re-downloading the app. When nothing else seems to work, you can try signing out of the app store and see if it fixes the issue. This also stops all current downloads and then you can resume the download again. Here are the steps you need to follow. Head to ‘Settings’ on your iPhone. 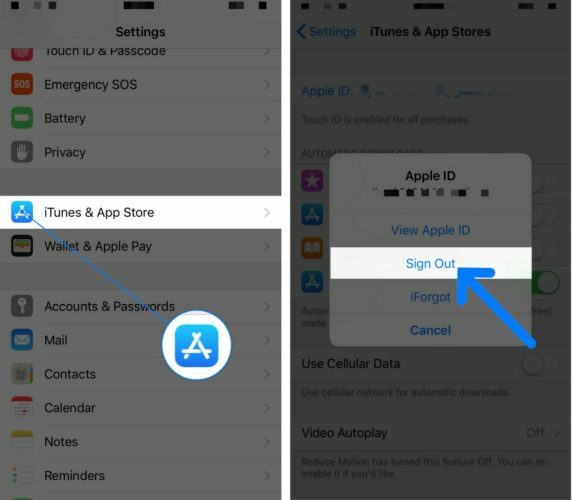 Now, move to ‘iTunes and App store ‘and then tap on the ‘Apple ID’. Now, you need to sign out from the popup menu which comes up. Now, in the field that comes up, sign in using a different Apple ID. While there is no official proof, it has often been seen that sometimes closing the background apps can lead to solving of the problem. So, you should double press the home button and then flick away the apps to remove them. Now, the iPhone should have enough free space and the app may resume downloading. 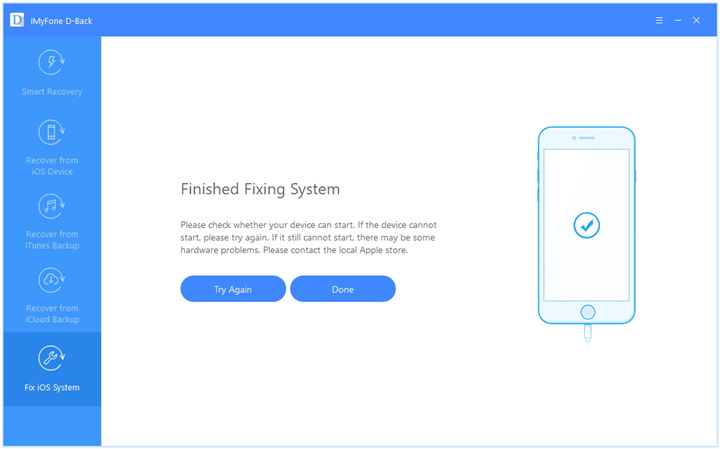 If the problem still persists, you can try to download iMyFone D-Back iOS System Recovery and see if the tool can fix the problem. It is one of the smartly designed tools that comes packed with too many features. We will familiarize you with what this tool can do to give you an idea regarding why you too should opt for it. 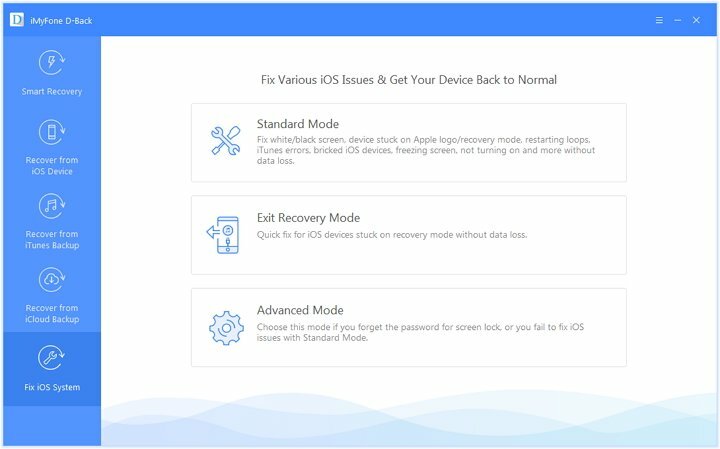 It can be used to fix different kind of iPhone bugs, just like downloading issues, iPhone keeps restarting, stuck on white Apple or Recovery mode, etc. Your device will not be damaged and will be back to normal after the fixing process. It can also be used to recover deleted or lost data from iPhone/iPad/iPod touch with/without backup. It is highly recommended by Cult of Mac and Makeuseof. Now that you know the features, let us see the steps which can help you fix the bug. Step 1. 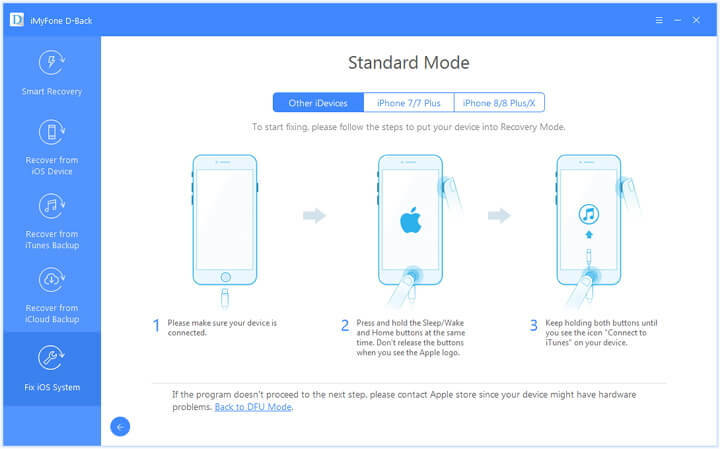 Download iMyFone D-Back iOS system recovery on your system and connect your device to it as well. 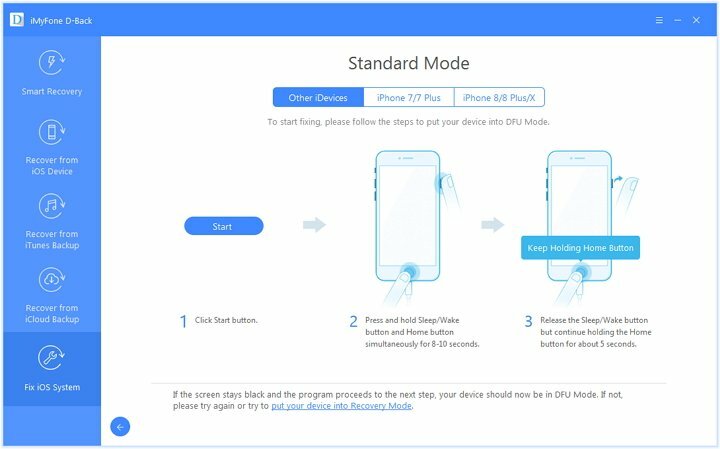 Click “Fix iOS System” option from the left penal and choose the standard mode and then the program will prompt you to enter your device in the DFU or the recovery mode for the process to begin. Step 2. To put your device to the DFU mode, you need to press and hold the sleep/wake button along with the home button simultaneously for nearly 10 seconds. Now, hold the home button for 5 more seconds. If the device fails to enter the DFU mode, we will opt for the recovery mode. Step 3. To put the device to the recovery mode, press and hold the sleep/wake button along with the home button together. Keep holding the buttons until you see the “connect to iTunes” displayed on your phone. Step 4. 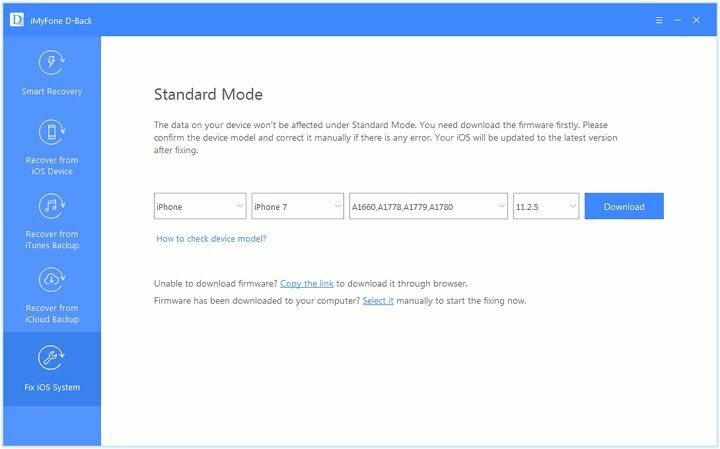 When you have entered either of the two modes, you will then need to click on ‘download’ as the program will spot the latest firmware for your device. Step 5. When the download is done, click on ‘start to fix’ and the program will fix the different iOS errors without leading to data loss. So, now that you know the right tool, you can choose the best ways by which you can handle the problem and get your phone running smoothly as before.